Bergen is known as the gateway for exploring the majestic scenery and fjords of Western Norway, so it’s possible that you won’t want to linger in town too long before venturing further afield into the surrounding landscape. 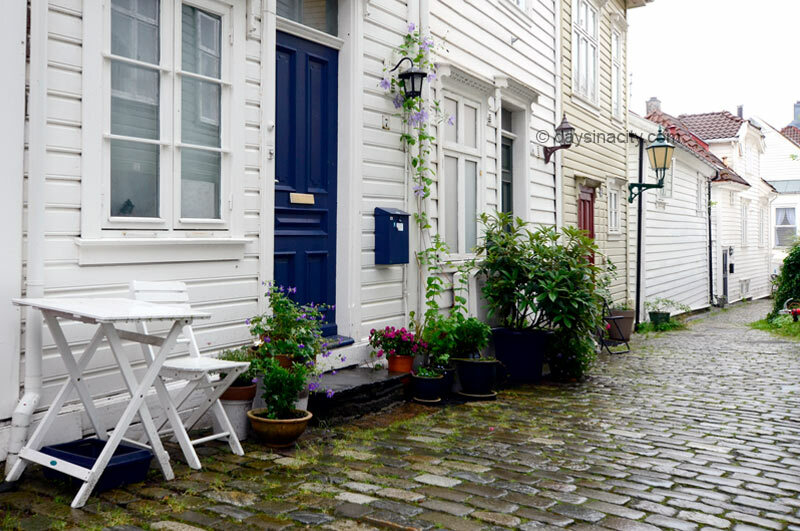 No matter what type of traveller you consider yourself, one day in Bergen should be all you need to get a feel for the city and see all of the key sights. With approx 240 wet days a year, it would be wise to leave your hotel with an umbrella and wet weather gear. If the weather is looking ok, a good starting point would be the Fløibanen funicular which will take you to the top of Mount Fløyen for the best view over Bergen. After coming down, the UNESCO world heritage listed old wooden houses of Bryggen are just across the road from the funicular. Wander through the narrow alleyways, explore the boutique stores and perhaps grab a coffee from one of the cafe’s. 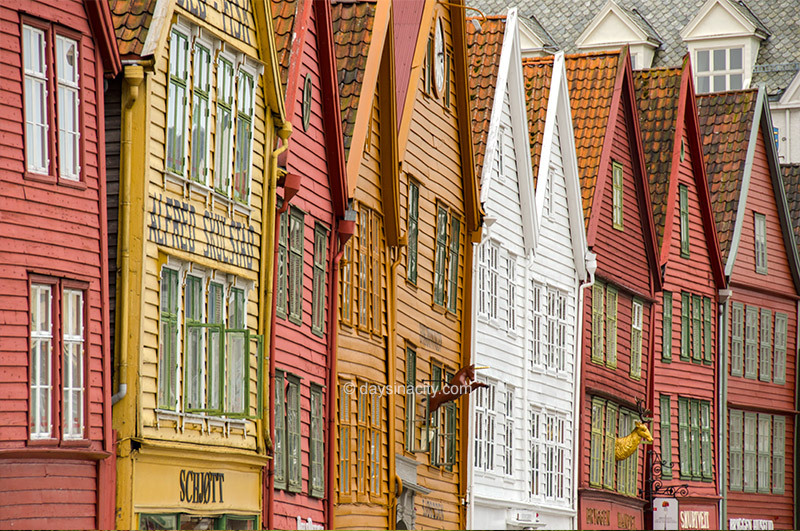 To learn more about Bryggen and it’s important place in Bergen’s history, head into the Hanseatic Museum located on the corner of Bryggen. This museum will take you back in time and allow you to walk through one of the old German merchant houses. Your ticket will also give you acess to Schøttstuene, the preserved kitchens situated behind the houses. A short walk from here is the Bergenhus Fortress that quards the enterance to Bergen’s port. It includes Haakon’s Hall and the Rosenkrantz Tower. Heading back towards Bryggen check out the Fish Market next to the Tourist Information Center. In the afternoon, most likely you’ll still have time to check out at least one other of Bergen’s museums, perhaps one of the Kode Art Galleries (the Edvard Munch collection is particularly popular) or the Aquariam on the other side of the port. If you’ve got more time up your sleeve & are looking for more to do in town to fill an additional day or half day, consider checking out the Bergen Museum or heading a little out of town to see Troldhaugen (home of composer Edvard Grieg) or the Fantoft Stave Church. 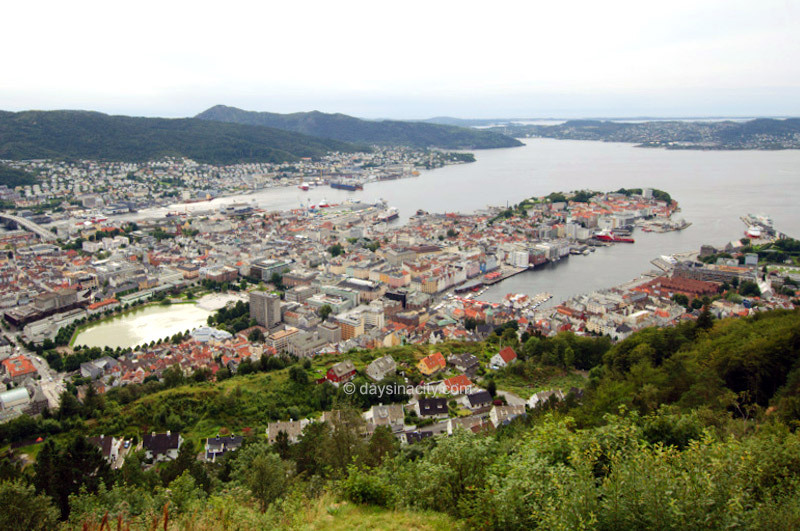 If the weather is nice, you could wander around Gamle Bergen (Old Bergen) or head up Mount Ulriken. After exploring Bergen itself, most travellers either begin their adventure further north, whether it be by the Hurtigruten ship, a car, or take day trips to either Hardangerfjord or Sognefjord. A popular and highly recommended trip is Norway in a Nutshell. It is a highly customisable self-guided tour that can be stretched over as many days as you like (with transport and accomodation included in your package), or even if just for a single day. The most popular option is taking the train to Voss, a small and beautiful lakeside town (most likely you’ve seen the town’s stylish bottled water everywhere), and then continiung further onto Flåm on the infamous Flåm Railway. You then take a ferry on the Sognefjord down the Nærøyfjord arm to Gudvangen, and then return to either Bergen, Voss or Oslo – you choose.